At Spartan Doors, we design and manufacture specialised doors for unique applications. Our range of specialised doors includes both certified and non-certified options to suit the project requirements. The acoustic series of specialised doors from Spartan Doors offers three different Rw ratings. All acoustic doors are tested as they would be installed; this means the seals are tested, as well as the door leaf. This ensures that our Rw rating accurately represents the actual noise reduction provided by our door. Each of our pressure doors is custom engineered to suit the application. The materials used to build the pressure door can also vary dependant on size and pressure differential. The doors can be designed for use in any application where the door needs to withstand a constant or temporary pressure differential – which is often the case in traffic tunnels or the mining sector. Spartan blast proof doors have been supplied for various applications such as: LNG plants, refineries and power stations, to name a few. 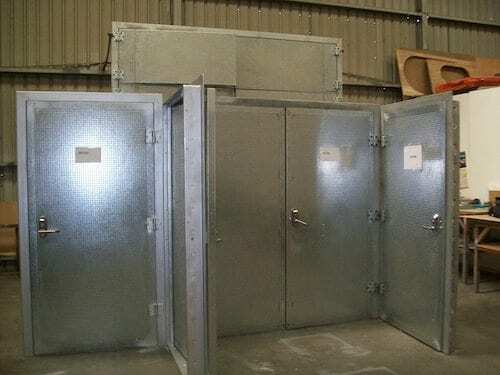 Some applications may require the blast door to meet a different level of standard, which is why we offer two models of blast door – using different construction materials and techniques to meet different standards. Some of our other specialised doors include ballistic doors and cyclonic doors. Each of them has the required test reports and certification. Contact us to discuss the Spartan range of specialised doors.